Liz Jaff’s postcard for her show at Kris Graves Projects just arrived in the mail. Although I rarely send exhibition announcements anymore, opting for the ease and economy of email and FaceBook, cards have a longer shelf life than an email, better color reproduction than an inkjet print, can be displayed, or, to make more room, filed in a drawer. 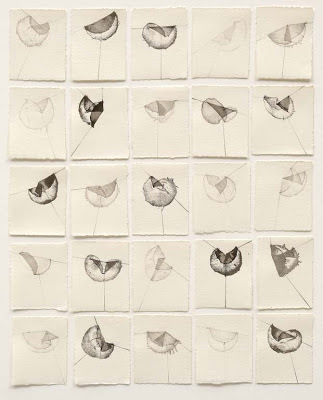 On the front of Jaff’s card is an image of nine exquisite drawings of a folded object, tacked to a wall. The full set of 400 ink drawings reference sequential film strips and photographic contact sheets. Jaff thus continues her exhaustive investigation of space as defined through folding. Postcards may take up a little space, but some are worth saving. “Liz Jaff: Diagramming a Fold,” Kris Graves Project, New York, NY. Through October 10. Also on view: “Jason Hanasik: He Opened Up Somewhere Along The Eastern Shore.” Through October 10.